When creating Decision Data rules that contain the resources that are used in text analytics, you can use an updated, automatically generated framework for each class of decision data that is supported in text analysis. With the automatically generated framework for each type of text analytics Decision Data rule, you can quickly create or update the records, without having to edit the default Decision Data rule form fields. You can create Decision Data rules in Designer Studio by clicking + Create > Decision > Decision Data. You select the definition class on the Create form of the new rule. The definition class contains the definition properties that are characteristic of each Decision Data rule type that you create. 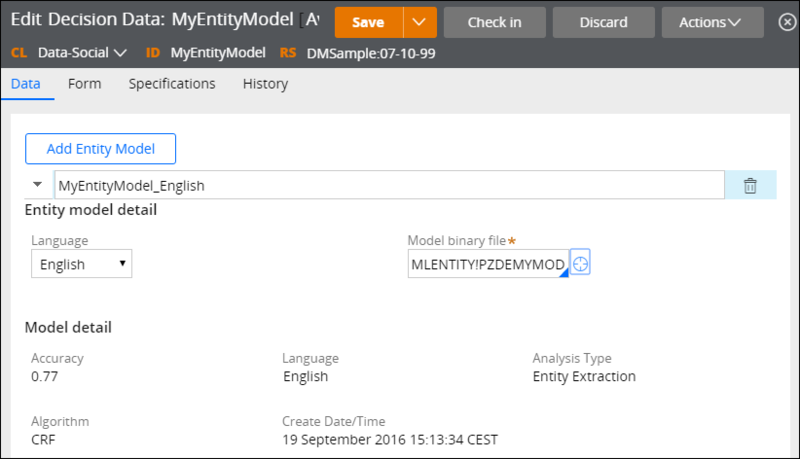 Create decision data that contains entity extraction rules in the Data-NLP-EntityModels definition class. Entity extraction models detect entities whose names are not limited to certain patterns or dictionaries. Entity extraction models can detect names of organizations, brands, people, and so on. Create decision data that contains entity extraction rules in the Data-NLP-Rule definition class. Entity extraction rules detect entities whose names match a certain pattern or are part of a dictionary. Entity extraction rules can detect names of hardware or software products, identification numbers, emails, dates, and so on. You upload entity extraction rules as Apache Ruta scripts. 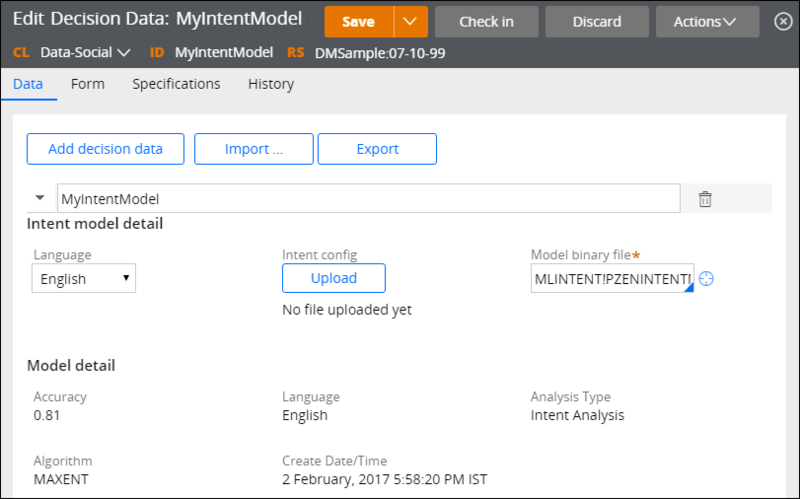 Create decision data that contains intent analysis models as part of the Data-NLP-Intent definition class. Intent analysis models determine whether the content (social media posts, comments, tweets, emails, instant messages, and so on) that you analyzed in your application was produced with an underlying intention. In the Intent config field, you can upload a .csv, .xls, or .xlsx file that contains your configuration for intent detection. For more information, access the configuration file that is part of the default pzDefaultIntentModel rule. 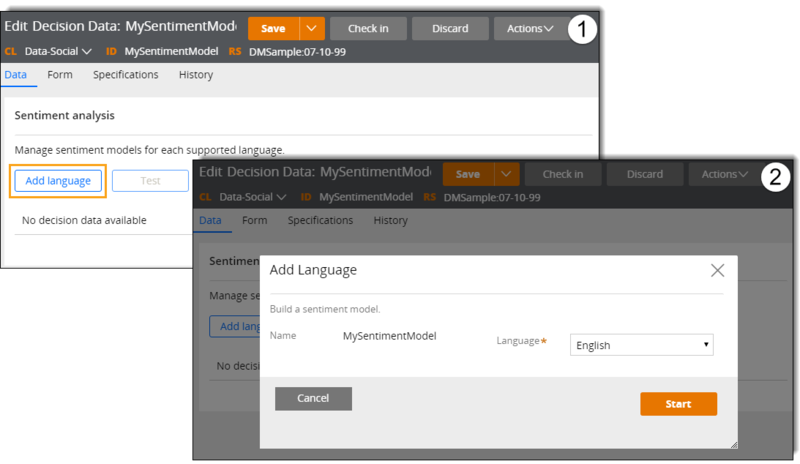 Create decision data that contains sentiment analysis models in the Data-NLP-SentimentModels definition class. Sentiment analysis models determine whether the analyzed text expresses a negative, positive, or neutral opinion. As part of creating or updating the rule, you can build sentiment analysis models by using a wizard. When you update an existing model for a specific language, that model is replaced by the newly created model when the creation process finishes. In a single Decision Data rule, you can have one model for each supported language. You can test the sentiment detection of the model that you created, based on the models that are part of the Decision Data rule. 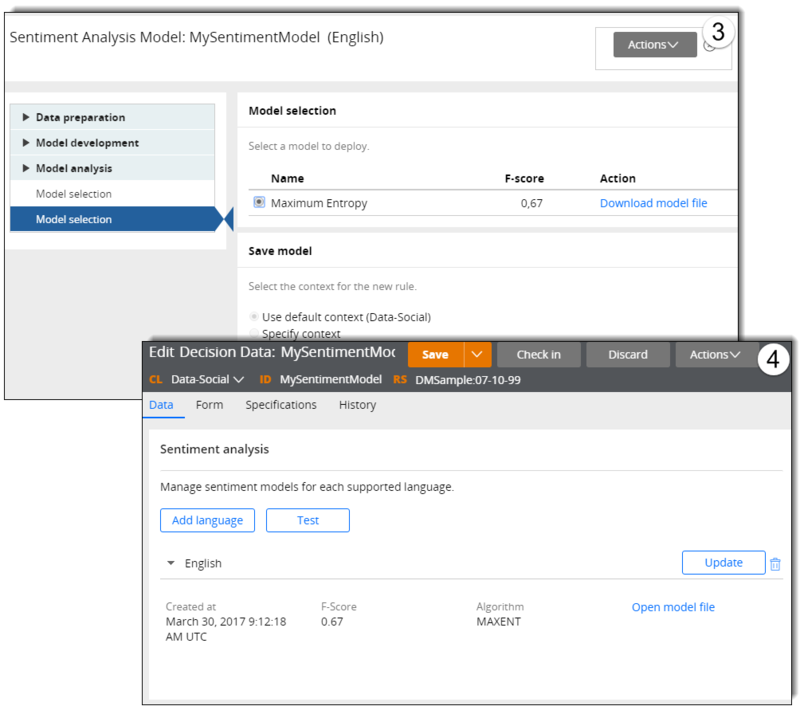 For more information about the wizard for sentiment model creation, see Creating sentiment analysis models. Create decision data that contains sentiment analysis models and taxonomies for rule-based classification analysis in the Data-NLP-Taxonomy definition class. Either by creating a classification analysis model or by using rule-based classification analysis based on taxonomies, you can determine the categories to which a text unit should be assigned. As in the case of sentiment analysis, you can use a Decision Data rule to build classification analysis models. Additionally, you can upload .csv, .xls, or .xlsx files that contain taxonomies for rule-based classification analysis. You can test how categories are assigned, based on the classification models and taxonomies that are part of the Decision Data rule. 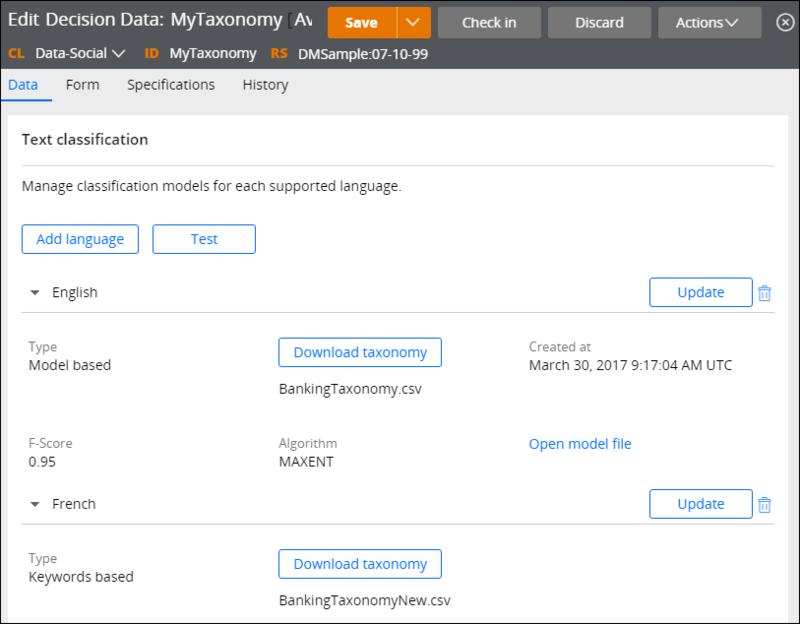 Business scientists can use the Decision Analytics workspace to build Decision Data rules that belong to Data-NLP-Taxonomy definition class. For more information, see Creating a Taxonomy Decision Data rule and Managing Taxonomy Decision Data rules. For more information about the wizard for classification model creation, see Creating classification analysis models. Create decision data that contains sentiment lexicons in the Data-NLP-SentimentLexicon definition class. Sentiment lexicons contain words or phrases that are assigned a sentiment value.